Swing dancers at Wilton’s Music Hall. Whilst most of the time I find myself photographing inanimate stuff like a delicious bowl of Moules Mariniere or the Interior of a beautiful house, occasionally I like to step out of my comfort zone and take on a challenge. I’ve never photographed dancers before, so this commission to shoot some of the lovely people from ‘Swing Patrol’ at Wilton’s Music Hall, was always going to be tricky. 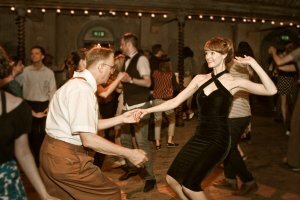 I did have a small head start in that I’ve been learning ‘Lindy Hop’ myself for a year now, so I can just about gauge when a nice move (like a ‘Swing Out’) is approaching. I love all the smiling faces, the hall was bouncing with this addictive dance, what a fantastic night!